Linux gaming has seen massive growth in the past two years, ever since Valve began openly supporting the open source operating system. That growth is nothing compared to what it will be after the launch of their Steam Machines, says Alienware’s product manager, Marc Diana. Talking to us at E3 he said “It’s going to be 20, 30 fold. Overnight. Diana ties his prediction to the uptake in developers using OpenGL over DirectX. Till now there’s been little competition between the two graphics libraries, Microsoft’s DirectX has been the go to choice for developers. However, in recent years that trend’s started to reverse. One reason for this is that it’s become much simpler to convert your game to OpenGL. “The CryEngine today is probably the best example of seamless transition between OpenGL and DX. You can build a game on CryEngine and the CryEngine will do the conversions to OpenGL for you. Diana admitted that adoption of new technologies is always “cumbersome at first” and that effects growth but the Steam Machine is “going to take that away.” At its core the machines are running a Linux operating system so people who buy into Valve’s hardware are buying into that platform and, with it, OpenGL gaming. “They’re going to increase user adoption rate 20 fold,” Diana predicts. The Steam Machine’s official launch has been delayed into 2015, till Valve are happy with the controller. 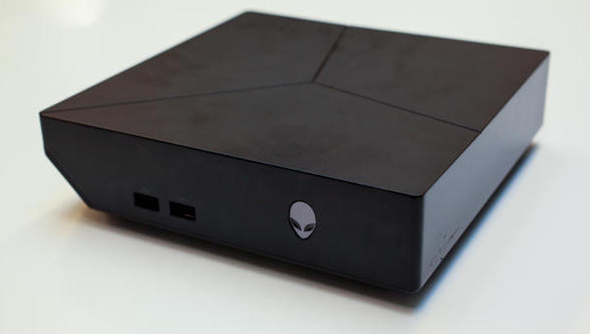 However, that’s not stopping Alienware releasing the device that was going to be their first Steam Machine, the Alpha. It can even run Valve’s SteamOS if you’d like it to but, unlike later releases, this one will come running Windows 8.